Every summer when the thermometer rears unexpectedly or remains at a high level longer than is comfortable, people assert that the climate is changing. The same thing happens in winter whenever rain sets in and persists in a fashion indifferent from that of which anybody has recollection. South Australia’s winter, this year has occasioned the same speculation; not without justification, when for three months … the climate appeared not only to change but to disappear altogether, leaving the State with no climate but with just wet weather. There is nothing more difficult than to remember and to compare weather that once prevailed with that experienced today. In no other sphere is memory so remiss or judgment so unreliable. It is fortunate for the community’s peace of mind that the Commonwealth Meteorological Office exists as a corrective to scare mongering and shameless prophecy. 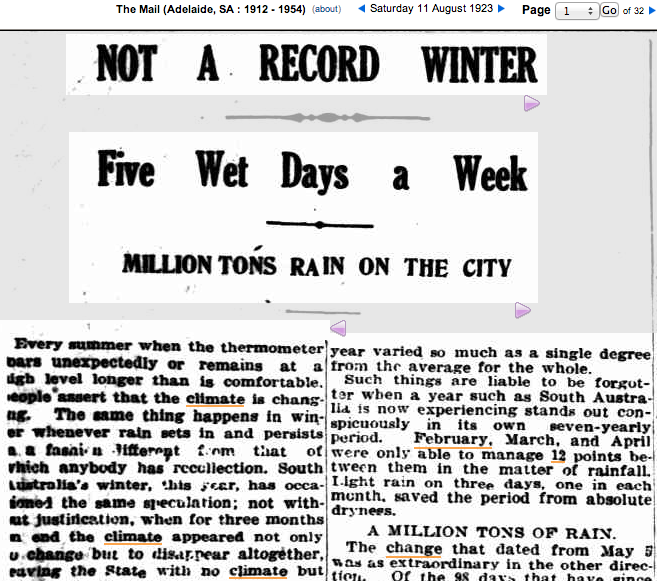 Mr. E. Bromley, Adelaide’s clerk of the weather has the facts, and the facts are that since Adelaide records were first taken 84 years ago neither in rainfall nor temperature has there been any change at all. 2014 : Bureau Of Meteorology – where bush fires, heat waves, floods and drought, once natural phenomenons of Australia’s harsh climate, are now cited as evidence of human induced climate change. And with global temperatures failing to rise over the past 17 years, the Bureau is all too quick to report the hottest ever: day, month, year, season. PR claims that tell us everything about marketing, and nothing about science. Swept up in climate change hysteria, BoM has become a veritable cheerleader for the environmental movement, preferring climate scare mongering and shameless prophecy, over objective and sceptical scientific climate analysis. THIS is why scientific organisations today have – tragically – become almost the last places to hear the truth about climate change. Too many jobs, egos, reputations and money are now at stake. Once a bastion of calm objectivity, the Meteorological Office now promotes climate scare-mongering.